17th Century Art in Holland: Portraiture, Genre Paintings and Still Lifes. please see: History of Art Timeline (2.5 Million BCE -present). Every so often a country experiences a period of spectacular artistic growth. In the case of Holland, this occurred during the era of Dutch Baroque art in the 17th century, with the emergence of genius-painters like Rembrandt and Vermeer. In particular, this Golden Age of Dutch painting is famous for what has become known as "Dutch Realism" - a highly detailed, true-life form of portrait art and genre painting, which proved very popular with the country's affluent middle class. The largest collections of works by Dutch Realist artists are in the Rijksmuseum, Amsterdam and the Mauritshuis in The Hague. The 17th century saw the emergence of Holland as a major European power. At the signing of the Twelve Years' Truce in 1609 the northern states of the Netherlands became independent of Spanish rule, and entered upon a period of rich cultural, economic and social development. Amsterdam had already taken the place of Antwerp in European trade and economy; it now became a centre for banking. Handsome merchant houses were built along its many canals and the rising class of prosperous traders and burghers created a demand for modest luxury goods. Bulb-growing became an important source of wealth. By mid-century the Dutch navy was beginning to threaten England's mastery of the seas. Despite the setback to art which resulted from the country's break with Catholicism, Dutch painters - notably from the schools of Amsterdam, Delft, Dordrecht, Haarlem, Leiden and Utrecht - made a vital contribution to the history of art during this century. The effect of Protestantism on painting was at first catastrophic. In Germany, Holland and England it seemed as if it might not survive. Many Protestants regarded pictures or images of saints in churches as Popish idolatory and painters in these countries lost their most reliable and lucrative source of income - the painted altarpiece. Neither could artists (in Holland at least) find employment in the decoration of sumptuous palaces, for the Dutch burghers were sober citizens who disliked what they regarded as the ostentatious pomp of the Catholic south. Book illustration and portraiture seemed to offer the only means for an artist to make a living, and there did not appear to be a large market for either. Nevertheless with increasing prosperity the demand for portraiture grew: a worthy burgher who had become a burgomaster would be proud to have himself painted in the insignia of his office; governors of charitable institutions or members of civic bodies - of which there were many in republican Holland - wanted group portraits for their board rooms or for the meeting places of their guilds and companies. Those artists whose work found favour with the public could hope to eke out an existence on this type of painting. 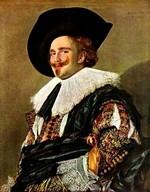 Frans Hals (1582-1666) was one such artist. Although Flemish by birth, Hals moved to Holland with his Protestant parents and spent most of his life there. The debts which Hals accrued with his baker and shoemaker demonstrate the adverse conditions of work for a Dutch painter. During his old age (he was over 80 when he died) he was supported by a pittance given by a municipal almshouse, whose board of governors had been pleased by his group portrait. Hal's great gift was for portraiture, especially for his impressionistic, 'snapshot' manner of catching a sitter's expression. The optimistic and jovial mood in which he portrays many of his compatriots perhaps represents the confidence of this first generation of free Hollanders. A Dutch artist was like a merchant selling the goods the public wanted to buy. If he had no patron he had to rely on the public. Without a talent for portraits he could not rely on commissions and had to turn to other subjects and to other methods of working. He must first paint his picture and then try to find a purchaser. He would offer his paintings for sale at picture markets or go to a picture dealer. Since competition was stiff, he tended to specialize and concentrate on one type, or genre, of painting which he could do well or which the public came to expect of him. 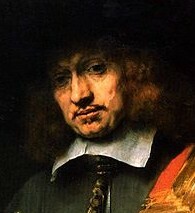 Paulus Potter (1625-54), for example, established a reputation as the foremost painter of cows and other animals. Other specialists included painters like Adriaen van de Velde (1636-72) or Jan van de Cappelle (1642-79) who - perhaps reflecting the rising importance of Dutch sea power - became famous for their seascapes; Jacob van Ruisdael (1628-82) and Meindert Hobbema (1638-1709) who did landscapes. Jan Steen (1626-79) on a popular level and Gerard Terborch (1617-81) with a greater degree of sophistication and elegance, who offered the public domestic interiors with figures usually involved in some little incident. This type of everyday scene, known as genre painting, became one of the great features of 17th century Dutch art. But the greatest painter of the age, Rembrandt van Rijn (1606-69) was not confined to any one of these painting genres - his vision ranged through many subjects, from portraits of all kinds to history painting and biblical art. That said, Rembrandt remains - essentially - a painter of people: a painter of faces, emotions and personalities. His career was full of contrasts: happily married, prosperous and known well beyond the confines of his native Holland, his success seemed assured during the 1620s, yet when he died in 1669 he left no other property than his old clothes and some painting implements. Rembrandt did not paint contemporary prelates and princes, but the people of Amsterdam, members of his family and above all himself. His remarkable series of self-portraits tells us much about the man, from the days of his youth and success to his lonely old age when his face betrayed the tragedy of bankruptcy and human suffering. As a devout Protestant Rembrandt was very familiar with the Bible and he penetrated right to the heart of his religious subjects, adhering closely to the text, bringing out the deep inner meaning of the events he depicted and never failing to reveal the genuine humanity of the biblical figures, bringing to them his profound psychological insight. See, for instance, his monumental picture Return of the Prodigal Son (1666-9, Hermitage Museum, St Petersburg) and Bathsheba Holding King David's Letter (1654, Louvre, Paris). NOTE: Rembrandt's greatest portrait paintings also include a number of sublime individual portraits. Chief amongst them are Portrait of Agatha Bas (1641, British Royal Collection) and Portrait of Jan Six (1654, Private Collection, Amsterdam). From now until its climax at the end of the decade Rembrandt's fame increased and simultaneously with professional success came a rapid rise in his social position, through marriage to Saskia van Uylenburg, a member of a wealthy patrician family. Rembrandt bought a house and indulged his extravagant collector's taste for bizarre objects. After Saskia died in 1642, objections to Rembrandt's increasing use of chiaroscuro and to his departure from tradition in the composition of his great group portrait the Company of Captain Frans Banning Cocq - commonly known as The Night Watch (1642, Rijksmuseum, Amsterdam) - contributed to a decline in his popularity with the public. He fell into debt and 14 years later, in 1656, was declared bankrupt. His house was sold and his collection put up for auction. Only the help of his new life companion, Hendrickje Stoffels, and his son Titus saved him from complete ruin, but both died before him and he lived, a lonely man, to the age of sixty-three. During his middle years after Saskia's death Rembrandt turned to religious art, to landscapes and to studies of the Jews of his neighbourhood, many of which he used in his Bible scenes. His contact with nature resulted in a large number of drawings and etchings of the Dutch countryside in which he developed a 'shorthand' method of recording his impressions which contrasts strikingly with the frequently Baroque manner of his painted landscapes. Rembrandt's later work acquired that natural simplicity, profundity and psychological penetration for which he is renowned and revered. His Night Watch of 1642 marks the shift towards his late style; in this painting he broke with the conventions of group portraiture in subordinating some of the individual figures in the interests of a more dramatic and unified composition. Rembrandt chooses the moment when the drum sounds the call to arms and the company of burghers surge forward from all sides to join their leaders. In this way, he transforms a static group portrait into an animated assembly. Another outstanding group portrait is Syndics of the Cloth-Makers Guild (The Staalmeesters) (1662, Rijksmuseum, Amsterdam). This commission was awarded to Rembrandt after his bankruptcy, indicating the respect he still commanded. Rembrandt's late interpretations of biblical scenes also depart strongly from tradition. The spectacular and ornate gives way to an exclusive concern for the inner, spiritual meaning of the event, as in his Return of the Prodigal Son, painted between 1668 and 1669. All the emphasis is placed on the meeting between the father and son, the father's pose, as he bends down over his kneeling son, communicating the utmost forgiveness and tenderness. The same profound communication of human feeling and the spiritual values of tenderness and trust occurs in another late painting - The Jewish Bride (Rijksmuseum, Amsterdam) - painted in 1665. The love between the married couple is movingly conveyed in their expressions and in the lady's simple gesture of pressing her husband's hand to her heart. NOTE: Rembrandt's historical painting includes several wonderful secular works. They include Aristotle Contemplating the Bust of Homer (1653, Metropolitan Museum of Art, New York) and The Conspiracy of Claudius Civilis (1661, Nationalmuseum, Stockholm). Nothing could be more different to the art of Rembrandt than the controlled, moralistic and cool interiors created by Jan Vermeer of Delft (1632-75). 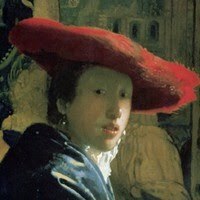 Vermeer's cool objectivity and passive quality is the antithesis of Rembrandt's warmth and human involvement; while Rembrandt had a prodigious output Vermeer was slow in his working methods and had a very small output. Yet superb handling: of light and shade is common to both painters' work. Today, Vermeer is regarded as the leading member of the Dutch Realist School of Genre Painting and a key figure in Protestant Reformation art of Northern Europe. But none of this was apparent during his lifetime. Indeed, he was no more than a moderately successful painter when he was alive, and when he died his work was largely forgotten about. That is until the publication of an essay in 1866 by the art critic Thore Burger, which elevated Vermeer out of obscurity. Vermeer's greatest genre paintings include: The Milkmaid (1660, Rijksmuseum, Amsterdam); Young Woman with a Water Jug/Pitcher (1662, Metropolitan Museum of Art, New York); The Art of Painting: An Allegory (1666-73, Kunsthistorisches Museum, Vienna), also called The Artist in His Studio and The Allegory of Painting; and The Lacemaker (1669-70, Louvre, Paris). Some of Vermeer's most beautiful interiors portray women in the privacy of their room. See, for instance, Woman Holding a Balance (1663, National Gallery of Art, Washington); and Woman with a Pearl Necklace (1663, Gemaldegalerie, SMPK, Berlin). Vermeer was born in Delft when Rembrandt was 26 years old; he thus belonged to the third generation of the great era of Dutch painting. By the middle of the century the Dutch had become accustomed to peace, and the optimistic vitality of an earlier painter such as Hals gave way to a quiet refinement. The cultured enjoyment of music and painting is a frequent theme of Vermeer's work. Oil paintings like Woman Playing a Lute near a Window (1664, Metropolitan Museum, NY); The Concert (1665, Isabella Stewart Gardner Museum, Boston); The Music Lesson (1665, Royal Collection) (also called Lady and Gentleman at the Virginals); and Girl with a Flute (c.1666, National Gallery, Washington DC); all indicate the more sophisticated nature of Dutch social life. Nearly all Vermeer's genre works include a figurative element - an exception is The Little Street (1658, Rijksmuseum, Amsterdam) - and some verge on portraiture. See, for instance, Girl with a Pearl Earring (1665, Mauritshuis, The Hague) known as the "Mona Lisa of the North"; and Girl with a Red Hat (1667, National Gallery of Art, Washington DC). Other important Dutch genre painters included: Adriaen Brouwer (1605-38), Adriaen van Ostade (1610-85) and David Teniers the Younger (1610-90), all noted for their moralizing 'tavern-scenes'; Gabriel Metsu (1629-67) noted for his intimate domestic scenes; Samuel van Hoogstraten (1627-78), famous for his interiors with deep linear perspective; and Pieter de Hooch (1629-83) who painted similarly impersonal interiors. Hendrik Terbrugghen (1588-1629) also produced some excellent genre works, although he was best known for his religious paintings. As noted above, following Luther's revolt against the Church of Rome (c.1517), demand for religious paintings suffered a serious decline in the newly independent Protestant Dutch Republic. As we have seen, this led to an increase in both genre painting and portraits. In addition, it opened up a third genre - namely Still Life painting - a genre which was encouraged by the popularity amongst artists of oil painting, which permitted greater re-working of a picture and thus finer detail. In many ways, still life was the purest form of Protestant art, at least in Holland. It was a down-to-earth form of painting, which appealed to industrious Dutch home-owners, and contained a complex mix of religious symbolism. One particular form of still-life (called vanitas painting) consisted of varying arrangements of domestic objects designed to remind the viewer of the transience of life on earth. The leading still life painters in the Netherlands included: the Antwerp artist Frans Snyders (1579-1657); Pieter Claesz (1597-1660), noted for his breakfast still lifes (ontbijtjes); Willem Claesz Heda (1594-1680), Jan Davidsz de Heem (1606-83) and Harmen van Steenwyck (1612-56), all famous for their vanitas paintings; and Willem Kalf (1619-93), best-known for his ostentatious still lifes (pronkstilleven). Another type of painting which became popular during the Dutch Golden Age was the portrayal of church interiors. The greatest, or at least purest, exponent of this was the hunchbacked Pieter Jansz Saenredam (1597-1665), who was the first artist to produce architecturally faithful depictions of buildings, rather than the more imaginative 'inventions' popularized by others. Another outstanding exponent was Emanuel de Witte (1615-1692), better known for his grasp of linear perspective and his sense of atmosphere, rather than the accurate architecture of his compositions. Lesser practitioners included Gerard Houckgeest (1600-61) and Hendrick Corneliszoon van Vliet (1611-75). In 1672 the French King Louis XIV invaded Holland. The French advance was checked by William III but, in spite of this success, Holland was already declining as a world power. This decline was reflected in her artistic output and by the end of the century the 'golden age' of Dutch painting was over. Dutch and Flemish paintings from the era of Jan Van Eyck, Hieronymus Bosch and Pieter Bruegel the Elder. Characteristics and styles from illusionist architectural murals to Caravaggism, Venetian colourism, the drama of Rubens and the classicism of Poussin, Claude and others. The story of art in Flanders during the 17th century, from Rubens to Anthony Van Dyck.  For more about Netherlandish painting, see: Homepage.